This is a gorgeous Gingerbread cupcake creation by Kurt Adler and part of the Gingerbread Kisses Collection. This Gingerbread cupcake house is decorated with lots of pink frosting and sprinkles, candy cane accents, star no top and wreath on door. 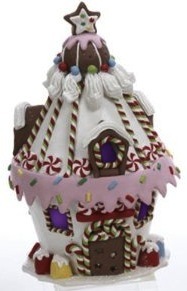 Gingerbread cupcake house is detailed with LED lights and the entire piece glows like sugar crystals. Would make a wonderful gift or holiday decoration. Please visit here for details.